Little Corinna is a wonder. Born totally unassisted, up and nursing in 15 minutes. IGg 2134. Strong and very straight, very crimpy and full of rose grey. Her blanket seems a consistent fawn, but head and legs are quite a pretty rose grey. Corinna's Sire, Achiever is building quite a show record, and his Son won grand Champ at the Spring Michigan show. We think this little girl has great possibilities. For Vigor, I give her an A+ . Let's follow her progress. If you are looking for a nice female, with good bloodlines that can pass on color, crimp and hybrid vigor, maybe give this girl a hard look. Corinna has matured rapidly, weighs 130#, and is flirting shamelessly with the boys. She is showing that vigor that is true of all Almond Joy's cria, and will impart that same vigor to her own cria. 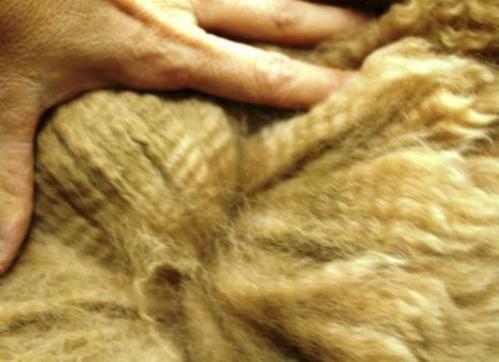 Her fleece from shearing is beautiful, consistent, soft and crimpy. Corinna sells with a free breeding to any Herdsire from Benchmark Alpacas or Autumn Alpacas.